9.30, meet up at meeting point. Enjoy a special “La Han” Vietnamese welcome tea. Teake a pleasant stroll from meeting point at Chau Long st to Truc Bach Lake for your first tasting – Pho Cuon. 10.15, Next stop Chau Long Market, for a tour of the market highlighting the ‘wet”/ unsual fruits/ livestock/ frogs. Sample of market foods of your choice. 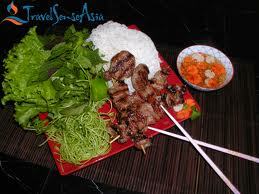 For example tree tomatoes or green mango with chili, silkworms, pork with green rice. 11.00, next stop at Tay Ho. We will take taxi to West Lake shrimp restaurant to sample West Lake’s most famous dish. 11.45, back into taxi and off for Xuan Dieu for one of the best “Bun Cha” stalls in Hanoi. Enjoy Bun Cha. On the way back, we stop at Yen Phu for a traditional café, established since 1936. 12.40, back to cooking centre to make black sesame, peanut and coconut sweet soup. 1pm, relax in courtyard with vietnamese coffee and receive home going gifts.